In some applications, the division of flow may need to suit specific actuators with irregular ratios, a multiple or uneven number of splits may be required or even the ability to fine-tune the system in the field without losing accuracy. Standard spool type flow dividers make addressing these application issues almost impossible. An alternative method of flow division that DOES address these issues can be achieved by using separate low cost cartridge valve elements. If your system requires any or all of these features, then keep reading. - Multiple divisions: any practical number of legs – even odd numbers. - Irregular percentage split: not dictated by the factory pre-set ratios due to divider spools. - Accurate (compensated) trimming can be achieved: due to hydraulic motor leakage etc. Under normal circumstances, the higher loads lose pressure compensation as the pump pressure falls below (load pressure + compensator value). The higher loads would slow or eventually stall while the lower loads would still be compensated and take priority of flow. The concept of using individual elements for flow division uses the same principals that are commonly used for Flow Sharing, but is viewed from a different perspective. Flow Sharing is predominantly used in mobile circuits where simultaneous demand at two or more actuators exceeds the pump flow, a condition that is exacerbated by variation in prime mover torque/speed. Flow sharing, also called post compensation, together with load sensing ensures that individual control orifices always see the same pressure drop by effectively counterbalancing the lighter loads. The biggest difference between flow sharing and flow dividing using the post compensation method are the number of and type of orifice used. In the flow dividing circuit below, the pressure of the highest load is applied to all EP Logic Element valves such that all orifices see the same pressure drop irrespective of pump flow. This is the very basic version of a sharing circuit. If more sophisticated flow sharing was needed, the simple orifices would become proportional valves. The Individual flow leg orifice sizes are calculated using the desired proportion of the maximum (or optimum) pump flow together with the compensation spring, which is the delta P value. The engine speed range is 1000 to 2500 rpm but normal max speed is 2000 rpm. Pump output at 2000 rpm is 100 lpm / 27 gpm. 1) Chose a pressure compensator value of 16 bar / 230 psi so when engine speed falls to 1000 rpm the individual orifice drop will still be a reasonable value to provide low flow accuracy (half speed = ¼ pressure drop --- 4 bar / 54 psi in this case). 2) Use the orifice calculation to determine individual orifice sizes based on 16 bar/230psi drop and the flow at 2000 rpm or 100lpm/27gpm. OK, so you probably can’t get a hold of a 2.13mm drill bit, but you see the principle that a high-flow and more efficient flow dividing solution can be achieved without actually using a spool-type flow divider. Bear in mind that you can also use needle valves or parallel orifices for each section (as in spool dividers) to achieve the desired ratio. Spool divider ratios are normally fixed at manufacture, limited to 2 way splits, require higher pressure drops and are generally less versatile for fine tuning during prototyping. Flow Sharing applications normally require individual flow modulation. 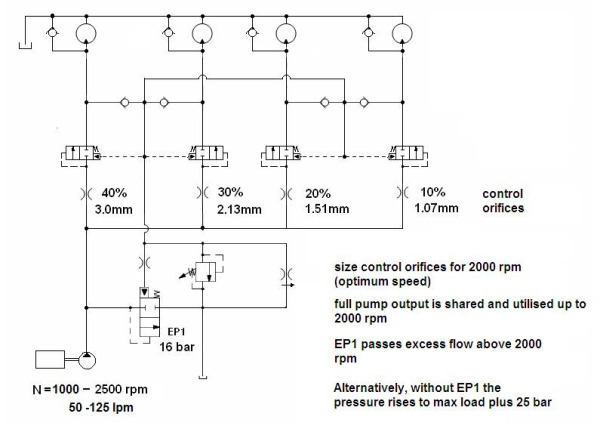 Flow dividing using the logic elements and orifices in a simple post compensation circuit allows you to; vary ratios by simply changing orifices, divide the flow to a reasonable number of work legs, lower pressure drops, fine tune orifices due to motor leakage or other system inefficiencies, and unload unused flow when operating at above nominal flow conditions. And this option is quite cost effective compared to standard spool flow dividers and sophisticated flow sharing options. So, if the question is Flow Dividers or Logic Elements – when designing with cartridge valves, you can make that decision.